NextGuitar Heroes: Nancy Wilson’s ‘Crazy On You’ Intro. With a message like that from Lumsden, it’s no wonder her latest single has been received so well. Taken from the album Real Class Act it stands as one of the more serious tracks from what is otherwise a lively album. In fact, Real Class Act has been nominated for an Australian Record Industry Association (ARIA) Award for Best Country Album. That said, I find myself in a curious place having interviewed Fanny Lumsden on the eve of the 2018 ARIA Awards scheduled for next week. If Lumsden happens to take home the award for Best Country Album, I just might have to put in a request to interview her again! But in all seriousness, we sincerely wish her all the best for next week. Here is some of what we talked about. You have nurtured a very Australian outlook and aesthetic to your music. How important is that to you? I suppose I write about what I know, my experience and that happens to be a very ‘Australian’ outlook, I grew up on a farm in western NSW, spend the majority of my time touring regional and remote Australia, so I think it’s only natural that my influences are strongly aligned with it. Also I’m really into that nostalgic Australiana because it reminds me of where I grew up and has a really tangible Aussie feel. What can you tell us about your recent trip to Nashville. What are some of the surprising things that you learned while over there? What an amazing place. We had a ball over there both just soaking up the city and also playing at attending AMERICANA FEST. We had an 8 week old baby in tow who got sick in the first week so we learned that they have a surprisingly good hot water system (we needed to steam him regularly). I was actually also surprised how much I really liked it! I know that sounds strange however I wasn’t anticipating being so inspired by the hard working and high calibre of the musicians and artists there. It really gave me the energy to continue back here in Australia to be honest. Presumably you’re pleased with how Real Men Don’t Cry (War on Pride) has been received? It’s really blown us (Myself and Dan my husband and bass player) away. People have really connected with it and have generously shared the most intimate stories with us about their lives and how this song resonates with them. I think it’s been viewed over 80,000 times which for a clip which we filmed and edited ourselves and just put on our Facebook page, it’s pretty fantastic. We are just hoping that the message continues to get out and that people start a conversation about it, which in-turn prompts maybe men and women everywhere to think differently about how we view masculinity and vulnerability. It must be a real thrill for Real Class Act to be nominated for an ARIA award for Best Country Album? What do you think it is about it that has struck a real accord with critics and fans alike? AN ACTUAL THRILL. Big time. This for us is really the ultimate nod from our peers and the industry that what we are doing is of some value to people out there and actually sharing stories that matter to people out there. That’s pretty damn cool. I am not entirely sure why, however I really strive to be as honest as I can with everything I do, there is no line between what I am creating and myself and perhaps some people can relate to some of the things I am talking about somewhere along the line. Who knows. Where do we find you at the moment? WE are currently touring people’s back yards and small intimate spaces on our Under Our Hills Hoist tour, which has been a blast. We did this tour through Queensland earlier in the year and have brought it south for the second half and it’s such a joy. It’s a joy not knowing what you are going to get each night as you rock up to peoples places, but then added to as they open their homes to you. It’s more a two way thing rather than a one way exchange from the stage, also you get to snoop on their places which can be fun! 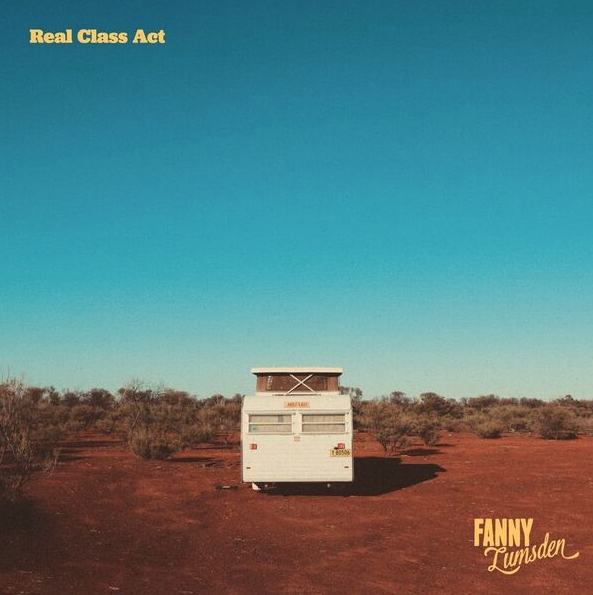 Fanny Lumsden’s album Real Class Act is available in all good record stores and digitally. For more information on Fanny Lumsden, including upcoming shows, check out her website. Follow her on Facebook. Follow her on Twitter. Listen to her on Spotify. Watch her on You Tube. Photo credit: The header image is supplied by the PR group Revolutions per minute. I am not the uploader of the You Tube clip embedded here. The Holy Crown of St. Stephen.